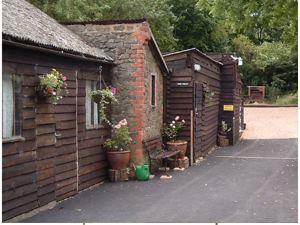 Berrow House Bunk House01531 635845work01531 635845fax BunkhouseBerrow House Bunkhouse sleeps 7 people in total. The main bedroom sleeps 4 people in bunk type beds. An upper bedroom sleeps 3 people in similar bunk type beds. The dining room and reception area, with ample easy chairs and heating, are available for all to use after a long days ramble. The adjacent kitchen has all the modern amenities required with hot and cold water, cooker, cutlery, crockery and a full range of cooking utensils. Two toilets and a modern shower are available for the use of the guests, as is heating and the use of a washing room with a dryer. The Fold was formally used as lambing sheds and has sleeping accommodation for 4 people in two separate rooms (2 per room). The Fold also has its own kitchen, with similar facilities to the Bunkhouse. It has its own shower and toilet. Heating and all electrical appliances are available. The Nook is a small caravan permanently positioned in a quiet and private corner of the campsite. It is available for up to 3 visitors with sleeping accommodation only. The Nook offers 1 double and 1 single bed in one room which can be partitioned off if required. A booking for the Nook is for exclusive use regardless of numbers in the party. Users may use all the facilities offered to Bunkhouse visitors. Bandsaw Barn is a meeting room / classroom. Seats up to 15 people and is available on a per day or evening only basis. (Please contact for more information / special arrangements). We also have 7 tent pitches and 1 caravan/campervan pitch. Hook-ups available. Located on the Land’s End to John O’Groats track this is a very popular place for families, cyclists, campers and walkers – especially with direct access to the Malvern Hills. Courses and activities are available to book, including Duke of Edinburgh awards. Berrow House Bunkhouse sleeps 7 people in total. The main bedroom sleeps 4 people in bunk type beds. An upper bedroom sleeps 3 people in similar bunk type beds. Take A449 from Ledbury towards Malvern. Turn right on to A438 through Eastnor up hill. Berrow House is behind the next phone box on right in Hollybush. Look for camp sign. Public Transport: Nearest train station and National Express service are in Ledbury, which is 3 miles from the hostel and would cost approx. £3 in a taxi.